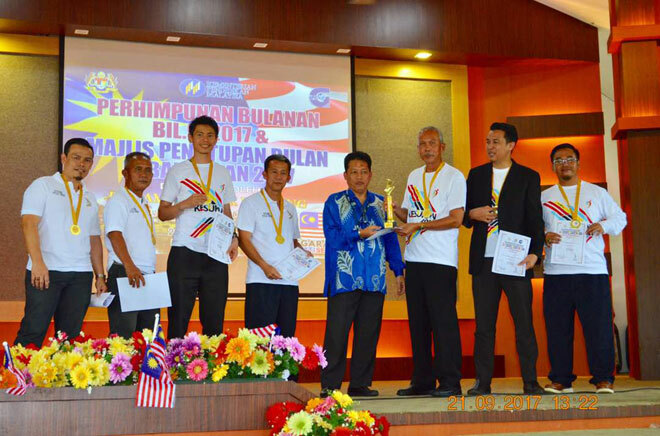 IPG Rajang Campus deputy director Kamarul Ariffin Din (fifth left) presents the trophy to team manager Mat Kamal (third right) during the IPG’s monthly assembly on Thursday. SARIKEI: Institute of Teacher Education (IPG) Rajang Campus team emerged champions in badminton during the Inter IPGM Staff Sports Championship (Kesukan) held at IPG Sultan Mizan Campus in Terengganu on Sept 15-17. The team consisting of Nguang Ung Siong, Mat Kamal Abd Majid, Senan Ja’afa Razali Sulong, James Siba, Zalnalabidin Talep, Wan Hairulbasar Wan Ahmad Mohtasa and Adib Farhan Sapian created history by lifting the title for the first time. “This is the fourth edition of the championship which we had never failed to participate in and this year we are champion for the first time,” Nguang said. They defeated IPG Tun Hussein Onn Johor Campus in the final after eliminating IPG Tuanku Bainun Pulau Pinang Campus in the semis. Nguang, on behalf of the team, thanked Meradong assemblyman Datuk Ding Kuong Hiing for helping to foot their expenses.